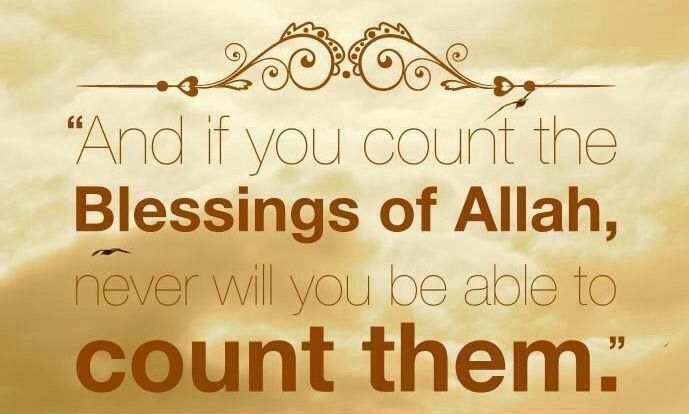 Allah is telling us that it is near impossible to count the number of favours He has bestowed upon us. From a religious point of view we know that the favours from Allah can be of a material nature, spiritual nature and moral nature. The material blessings Allah bestows to all of His creatures, out of His Compassion. He connects Himself to His creation on the basis of His Divine Compassion. So, whether people realise the blessings they are receiving or not; whether or not they are thankful to Allah for His blessings, He still bestows out of His Grace and Mercy. Take for example the relatively simple action of breathing which is done tens of thousands of times a day. And this important action is done with relative comfort and at no cost. Prophet acknowledged that he could not have sufficiently thanked Allah for His many favours that He bestows. It is also reported that Prophet Dawud (as) used to say in his supplication; ‘O Lord! How can I ever duly thank You, when my thanking You is also a favour from You to me’. Allah answered him, ‘Now, you have thanked Me sufficiently, O Dawud’. This teaches us that even the ability to thank Allah is also a favour and blessing that He has afforded us. Allah is the embodiment of wealth and we are all destitute. Allah is the Possessor of everything and we are in dire need of Him; and He is so Generous that whether or not we show gratitude to Him or not; He still bestows upon us. And yet there are the short-sighted people who believe that their blessings are as a result of their ‘hard work’. As we have mentioned material blessings are bestowed on all, the Muslims as well as the non-Muslims. How then are we, the believers, different? And why then should we be thankful if everyone is being blessed in a similar manner by Allah. So whatever little material blessings you have will vanish one day. The wise person will send a bit for “Allah to keep”. Do not waste what He has blessed you with in this world. If you have this knowledge you should act in accordance with it. Be extremely thankful to your Lord; because not only has He blessed you with some material gain, but He has also enlightened you in the appropriate manner of how to utilize it to its maximum. Morally speaking, Allah has blessed the Muslims in a special way; in that we possess the strength that enables us to follow His Habeeb, Prophet Muhammad (pboh). 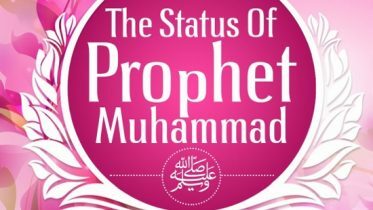 Prophet (pboh) came to perfect moral character. The Arabs lived in a very barbaric manner before the advent of Islam. And these uncultured tribesmen began following him because of his moral character. And if you can uphold your morals be thankful to Allah because He has assured us of the just reward for the morally conscious ones. Spiritually, Muslims are blessed in such a manner that no other nation possessed this unique blessing. When Hazrat Musa (as) and Isa (as) wanted to meet Allah they had to meet certain requirements and then ascend a mountain. We, ordinary slaves of Allah have the unique opportunity of meeting our Lord and Master a minimum of 5 times a day in the discipline of Salaat. As taught by our beloved leader, Allah comes between a Muslim and the Kaba when he/she stands for Salaat. And in it we have the blessed opportunity of glorifying and praising Allah. And we can also beg of Him for forgiveness, comfort, etc. And to this is further strengthened by Prophet (pboh) in the Hadith; “amongst my followers some will have the status of the Messengers of the Bani Israel.” Can you imagine walking amongst the Messengers of Allah? A lot of emphasis is placed on material blessings; and to the true believer this is neither here nor there. What is important is for us to understand the importance of showing gratitude to Allah. Even though we can never count His favours upon us and even though we can never thank Him as He ought to be thanked; still demonstrate submission and understanding. Keep in mind that you only have one life to live and we are not sure of what is in store for us tomorrow. So make use of the time as it comes and don’t wait until you’re older to “start following the religion”. Remember we will never have this time again, so use it wisely now. Make the effort, and leave the rest to Him and you will have no regrets on that Day. Whether or not you see or experience the favours being bestowed always remember that Allah will never let you down. We beg of Him to forgive us bless us and bestow on us His Divine Grace and Mercy and may He enable us to rise with the righteous. Be the first to comment on "Counting the blessings of Allah"